*One core Students' Book which covers Foundation and Higher Tier: the core range of the book is for C-D candidates. Extension work for B-A* candidates in the En plus pages; consolidation work for D-E candidates in the Encore pages. *Repromasters that provide consolidation and extension activities in all skill areas, vocabulary sheets, visuals for presentation, self-assessment checklists and regular formal assessment in all four skills. *Two workbooks (Workbook 1 to cover Year 10; Workbook 2 to cover Year 11). They provide consolidation work, particularly for D/C borderline candidates. 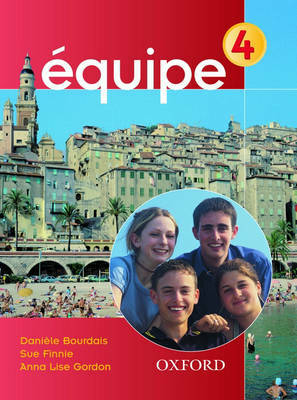 *A Teacher's Book which contains cross-references to all major syllabuses, notes on differentiation, answers to all activities (including the Equipe Informatique software package) transcripts to all listening activities, suggestions for further reinforcement and extension work, and homework opportunities. *Cassettes, containing clear, authentic listening material, with a self-study cassette. *An integrated IT component.